Property taxes in New Jersey are the highest in the nation. Since 2000, they have doubled and have risen at over twice the rate of inflation. No wonder people are forced to move; no wonder we have the highest foreclosure rate in the nation. That's from guest columnist Tom Byrne, who apparently is so busy with his gig on the State Investment Council that he doesn't have the time to find out that out-migration due to taxes is a totally fabricated myth. Or the time to read the Star-Ledger itself (the news part, which is still pretty good), which pointed out that New Jersey's high foreclosure rate is due, at least in part, to the state's relatively long foreclosure process. The obvious way to control property taxes is to hold the line on expenses, but this is fraught with political consequences, especially for Democrats. Public-sector unions like the NJEA and the two police unions, whose members' salaries and benefits are largely paid by property taxes, wield enormous influence in both general elections and, particularly, Democratic primaries. Positive change can be made. For starters, we could cut property taxes by about 8 percent simply by insisting that local employees get the same healthcare benefits that exist at the high end of private sector plans. That alone would save about $2.5 billion on $28 billion in annual property taxes. But what politician wants to risk the wrath of the unions? In fact, the average New Jersey government employee is paying more for individual health insurance coverage than government workers in any other state and the 10th-highest average premium for family coverage in the country. 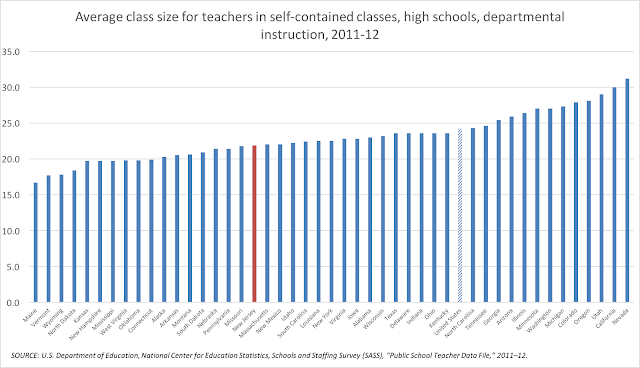 The most recent available data, from 2012-13, shows New Jersey with the highest starting teacher salaries of any state. But three states have higher average salaries than our $68,797. On top of this, data from the Bureau of Labor Statistics suggests that the value of total benefits added 29.4 percent or $28,520 to base pay for a total value of over $89,000. And then adjust as you will for a shorter work year. In addition: the percentage of total compensation that is attributed to benefits is 30 percent for private employees. * So, no, benefits aren't completely out of whack for NJ public employees. 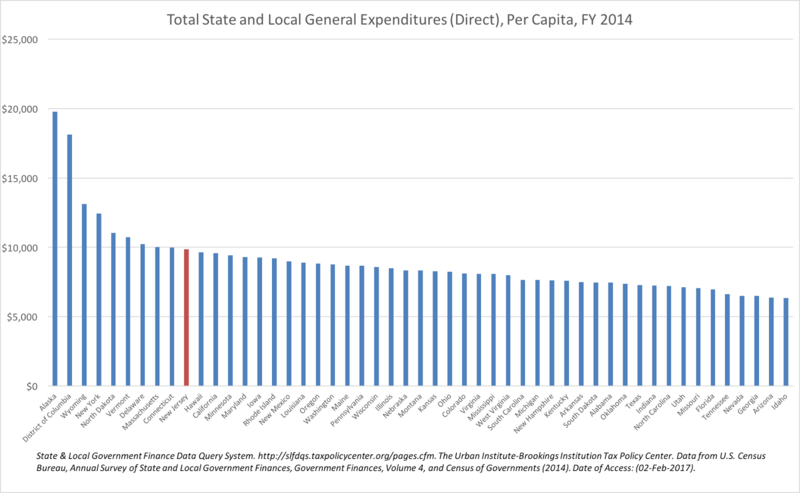 In addition, Byrne makes the freshman mistake of not adjusting wages for geographical differences. His comparisons here are, in a word, worthless. 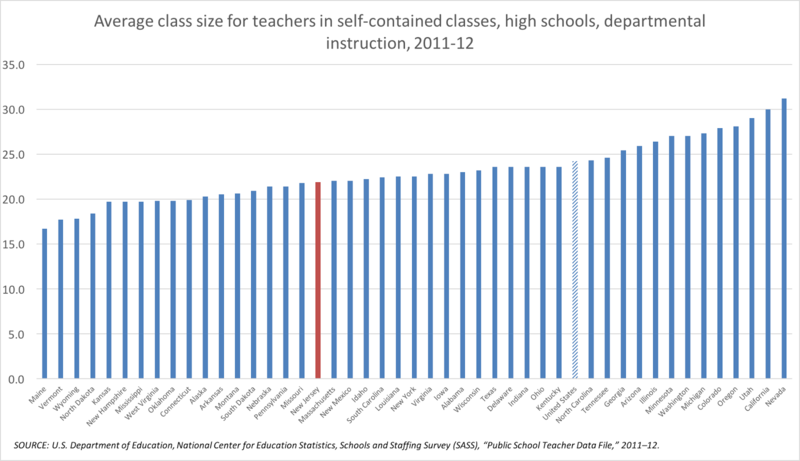 It seems that the bigger issue is proliferation of non-teaching staff. There are far more vice principals and administrators than a generation ago, which has not improved education. 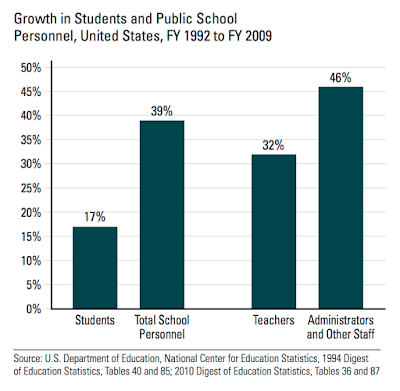 One national study shows that the number of K-12 administrators has increased 2.3 times faster than the number of students in school. If we don't deal head-on with these issues, we will shortly be forced to increase class sizes. No, it does not: the study, from the Friedman Foundation, shows that the combined group of administrators and "other staff" increased. In the period between 1992 and 2009, federal special education law underwent significant changes; it was also the time when No Child Left Behind passed. Both set new high standards, so it was inevitable that schools would increase personnel (including instructional aides) to reduce class size, expand offerings, provide remediation, and improve special education programs. Money matters in schools, and the largest expense in schools is staffing. It's also worth noting the United States does not overspend on education compared to the rest of the world when making appropriate adjustments for student characteristics and other factors. I heard one deputy commissioner of education say some years ago that if we had the same class sizes as the national average, we would save over $1 billion per year. 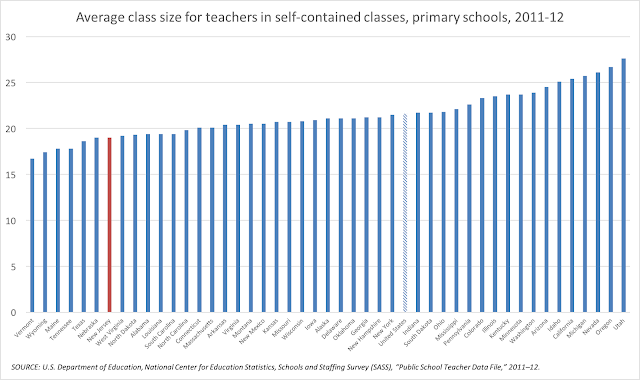 Yes, New Jersey's class sizes are smaller than the national average, especially in primary schools -- but, again, we're hardly an extreme outlier. And maybe our outstanding performance in academic outcomes owes something to putting more resources into schools and reducing class sizes. Yes, Massachusetts spends somewhat less and does very well, but we're not Massachusetts. Our kids are different and our labor costs are different. We aren't really far behind them, and we're not wildly spending more than they are. Regular readers know that pieces like Byrne's frustrate the hell out of me. We should be having serious conversations about fixing New Jersey's fiscal crisis. I'm all for looking at finding efficiencies in our school system: one clear way would be to stop having small, inefficient charter schools with large administrative expenses continue to proliferate. One more administrative example. Gloria Bonilla-Santiago, who runs a well-regarded charter school in Camden, says her custodial costs are $400 per student, versus $1,200 per student for the unionized custodians in the Camden public schools. The NJEA pointedly asks gubernatorial candidates if they would do anything to change this. Not if they want to win a primary election. Unless this is an extraordinary coincidence, Byrne gets this story wrong too. This anecdote and its specific dollar amounts are from Dale Russakoff's book, The Prize. This story is about a school in Newark; I debunk it here. I don't know what Bonilla-Santiago told Byrne; she's quite a character herself. But maybe Tom Byrne should spend a little less time talking with her and a little more time looking at real, credible research before writing his next op-ed. Keep those alternative facts coming, Tom! * One of the things that makes me nuts about pieces like this is that they are unclear about how they use the term "percentage." Given the figures here, benefits didn't add 29.4 percent to base pay; benefits are 29.4 percent of total compensation. That's completely different. Didn't anyone at the S-L proofread this? One of the more amusing things to come out of the Trump presidency -- that is, as amusing as things can get during this horror show -- is watching "moderate" Republicans and other center-rightists try to distance themselves from The Donald. Here, for example, is Andrew Sullivan (the guy who tried to convince us racism could be part of a legitimate academic pursuit) now thoroughly vexed that a maniac like Trump is in the White House. And here's David Frum, scared that Trump will sail to an easy reelection because Reaganomics always works, and therefore people will be so happy with the booming economy that they will readily overlook Trump's fascist tendencies. The problem with Sullivan's and Frum's arguments, of course, is that they desperately want to believe Trump is an anomaly; that this corrupt, intemperate, freak of a man just happened to be in the right place at the right time, up against the wrong opponent. It's only through some strange confluence of circumstances and some overlooked back door in America's political code that Trump was able to worm his way in and take power. The hard truth, however, is that Donald Trump was inevitable. That he is a product of a political and media system in which Sullivan and Frum have held positions of influence for years. That the conservative/neo-liberal framing of the issues (what Atrios calls the "Free Republic to New Republic" range of acceptable discourse) set up the rise of a nationalist like Trump. 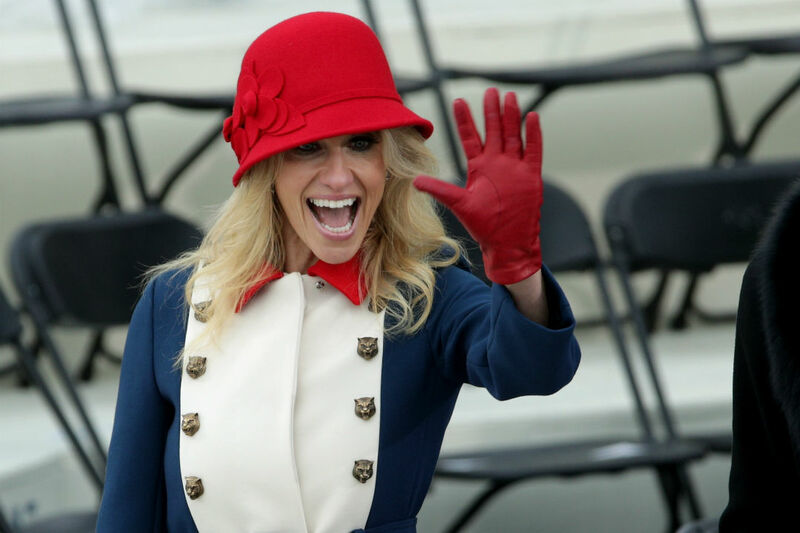 Some of the center-right is disavowing Trump, even though they were instrumental in creating him -- just like some of the neoliberal school "reformers" are disavowing Betsy DeVos, even though they were instrumental in creating her. Perhaps the most nebulous term in these discussions—aside from “school reform” itself—is the simple phrase “school choice.” Sometimes it just means charters, which are strongly supported by the Obama administration and many mainstream Democrats. But it can also mean vouchers, which are generally opposed by the center-left for diverting taxpayer dollars to private schools that may be religious, virtual, or for-profit. When DeVos appears before the Senate on Tuesday, part of the project for Democrats ought to be drawing distinctions—between charters and vouchers, but also between good charters and bad charters. They may have internal divisions on these issues, but Democrats should recognize that DeVos represents not just an unprecedented threat to public education but the worst of the “school choice” movement. Mrs. DeVos articulated strong support for parental choice. When most people hear parental choice it sounds like a good thing. Why might it be a problem? Choice is only as good as the quality of options available to our families. Choice without quality controls, particularly where profit-seeking entities are involved, often creates a menu where families are deciding among subpar options. DeVos who appears to have troubling conflicts of interest with multiple profit-seeking companies who could benefit from her confirmation as the Secretary of Education. Give Jeffries credit, the man knows how to stay on message: he never turns down a chance to beat up public schools. He also brazenly tries to lump a fundamentalist free-marketer like DeVos in with "traditionalists," which we all know (at least, those of us up to our necks in education policy) is code for "teachers unions." But what's remarkable here is the attempt to separate DeVos from the entire "reform" project -- just like the center-right is trying to separate itself from Trump. Sorry, my reformy friends, but you don't get away that easily. In the same way "moderate conservatives" have set up Trump, you've set up DeVos. 1) The "reform" movement has repeatedly -- and with very little evidence -- sold America on the idea that its schools are "failures." The notion that schools in the United States are abject failures compared to the rest of the world is completely without merit. Given the economic inequities in our country, and what we are willing to spend on schooling, we are just about where we'd expect to be in our educational outcomes. The "failure" of American schools is the bedrock on which all forms of school "choice" are built. DeVos's beloved school vouchers depend on the public believing that public schools are a mess -- but so do Jeffries' beloved charter schools. DFER's relentless beatdowns on public education have been enormously helpful to the vouchers pushers, and to the for-profit charter industry, which is taking money out of the classroom (more on this soon). 2) The "reform" movement has refused to acknowledge that the primary causes of the "opportunity gap" are the inequitable lives of children outside of school. Over and over, reformy types keep saying: "Poverty can't be the excuse that stops reform!" Their argument is fundamentally flawed: when millions of Americans are doing difficult, necessary work but can't live dignified lives, sending a few more kids to college isn't going to change much. We need real social mobility, but that's not the same as social equity. The millionaires and billionaires who donate to Eva Moskowitz's charter schools and DFER, the millionaires and billionaires who want vouchers to advance "kingdom gain," and the millionaires and billionaires who are making money off of for-profit charters all have a common interest in selling the public on the idea that economic inequity is the product of public school "failure." Let's not pretend for a second they aren't all aligned on this. And let's not pretend for a second that an entire industry of selling school "reform" to the masses isn't being bankrolled by very wealthy people who have a vested interest in the real status quo. 3) The "reform" movement has repeatedly blamed teachers and their unions for the "failure" of America's schools, ignoring the lack of adequate educational resources, especially for schools serving at-risk children. Almost all of those who regularly bash America's public schools have convinced themselves these schools have plenty of money. That's nonsense; many are lacking what they need, especially since the Great Recession. And we have plenty of evidence that school funding matters and can positively impact school performance. If we want to improve schools -- and I, like nearly all of my fellow public school teachers, want nothing more -- we should start there. What the "reformers" have tried to argue, instead, is that we can "fire our way to Finland." On its face, that argument makes no sense. And yet, again, it is a bedrock assumption that "good" and "bad" choice advocates make in promoting their vision of reform: that teachers unions have protected hordes of "bad" teachers, and that scads of potentially "good" teachers are waiting anxiously to take their place for less money and fewer job protections. 4) The "reform" movement has worked to de-professionalize education by repeatedly suggesting experience is an impediment, and not a virtue. The Teach For America types -- who have been implanted within the political mainstream to make arguments like this in the halls of power -- keep telling us that traditional teacher prep programs are a failure. American schools really need the "right" kinds of elite young people as teachers, constantly churning through urban schools. No need to bother with all that tedious coursework -- we'll just create some "alternate" prep programs. And now, Betsy DeVos. 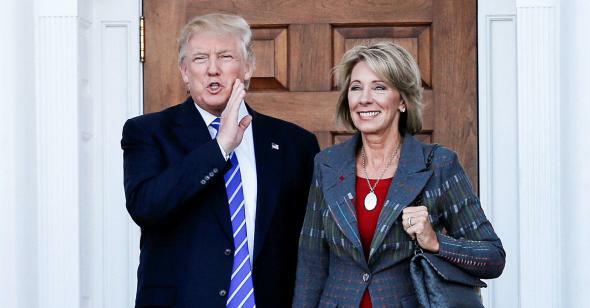 A woman so unqualified to be the Secretary of Education she embarrassed herself beyond belief at her own confirmation hearing. Over and over, neoliberal "reformers" told us experience wasn't as important as talent. Look where that thinking got us. Betsy DeVos is the inevitable result of the "reform" movement: a movement that has denigrated public schools, ignored the structural causes of the "opportunity gap," downplayed the need for adequate and equitable education resources, blamed teachers and their unions for "failure," and pretended a few elites with minimal to no experience could change the system for the better. Reformies, you now own Betsy DeVos -- just like the center-right owns Donald Trump. She is in office because of you. "Again I tell you, it is easier for a camel to go through the eye of a needle than for a rich person to enter the kingdom of God." - Matthew, 19:24. Turns out I'm doing a lot of speaking and panels over the next few months. Not all events are open to the public, but I thought it would still be useful to give a schedule. Scroll down for details on each event. If you attend any of these, make sure to come up and say, "Hi!" Details on conference registration to follow. "The Ailanthus Charter School has recently been granted conditional approval to begin operation in 2018. If final approval is given, approximately 7,000 Franklin Township students will be affected by a reduction of services and increase of class sizes due to potential layoffs. Our community currently has the highest number of charter schools operating within a non-urban district in the state of New Jersey. If we do not stop charter growth now, 20 million of our tax dollars will be allotted to these schools in 5 to 6 years." Childcare will be provided for children ages 3 and up. Please let us know in advance if you will need childcare. "Institutional racism is present in our communities of color in all aspects of life, whether it be in education, criminal justice, employment, housing, healthcare or politics. The evening will begin with a panel discussion. Participants will then take part in a powerful discussion of ways that we can address systemic barriers as we work to advance social justice." Hey, look who it is: Rebecca Friedrichs, the anti-labor right's favorite teacher! Last time we saw Friedrichs she was merrily leading the fight to destroy teachers unions by overturning almost four decades of judicial precedent and insisting on her right to freeload off of dues-paying teachers union members. And she's engaging in statistical malpractice of the worst order to sell school voucher schemes. 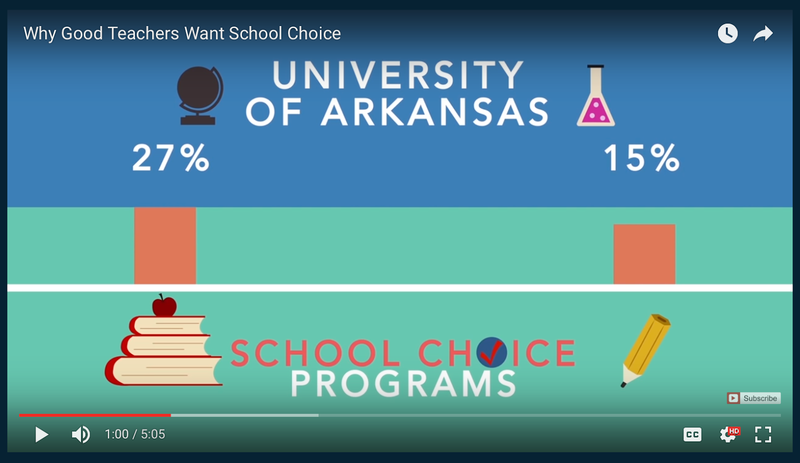 Here's a slick little video from the folks at PragerU featuring Friedrichs, where she explains that students who use school vouchers -- which allow families to use taxpayer monies to pay private school tuition, including religious schools -- get better academic results than if they attended their local public school. 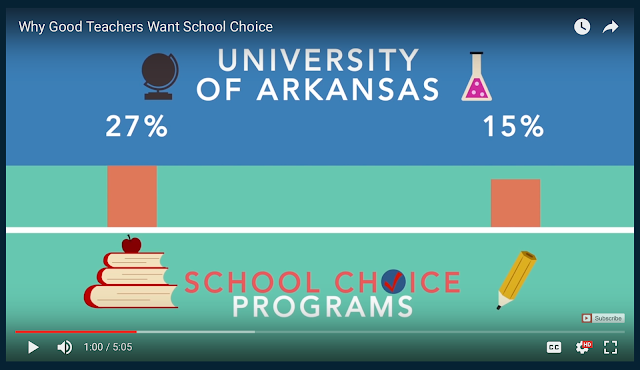 According to researchers at the University of Arkansas – in the most comprehensive study done to date -- students in school choice programs saw their reading and math scores improve by 27 percent and 15 percent, respectively. These numbers are alternative facts -- Friedrichs and the people who made this video got this completely wrong. How do I know? Simple: The UArk researchers admit their work was misrepresented. When someone says "Test scores improved by X percent!" you have to understand that doesn't mean a thing unless you know the range of scores and where the starting points were. Think about a test with scores from 0 to 100. If you got a 10 on our first try, and your score improves by 15%, you now get an 11.5, an improvement of 1.5 points. If you start with a 50, however, a 15% improvement raises you to a 57.5; that's an improvement of 7.5 points. Is that "more" improvement? Not necessarily; maybe it's really hard to break through a score of 10, and really easy to get more points higher on the scale. The point is that a "15% improvement" doesn't mean anything without context. So what researchers usually do is state their effect sizes in standard deviations. This is exactly what the UArk folks did in their study: .27 SD in reading and .15 SD in math. So how do we interpret this? Using one of the many handy SD-percentile calculators on the web, that .27 is like moving from the 50th to the 61st percentile. The .15 is from the 50th to the 56th percentile. That's an improvement -- but to a layperson, I'm guessing it's a lot less impressive than Friedrichs' figures. 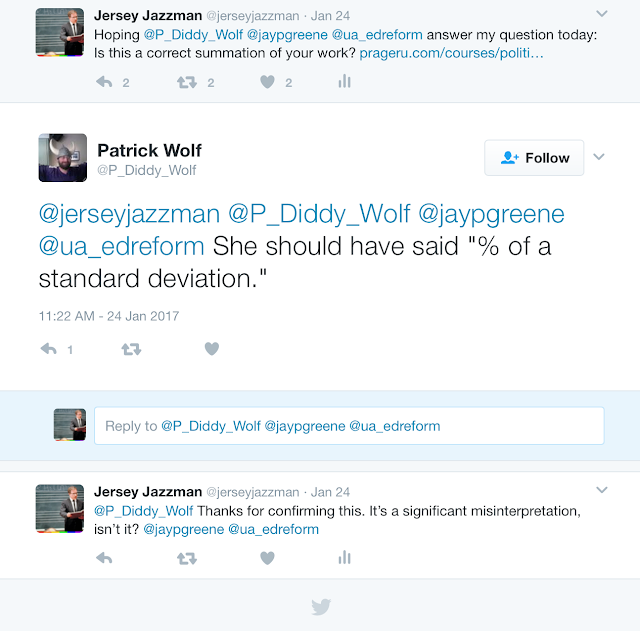 Friedrich's video completely misstates the effect sizes of school vouchers, arguably in a way that makes them appear larger than they are. Before I go any further, let me point out a big limitation of this study. You see, the UArk folks did what's called a "meta-study," which basically gathers up the results from a bunch of other studies and kinda-sorta averages them out to get one result. Their formal working paper goes into all the details. The effect of 0.04 given in the figure moves you from the 50th to the 52 percentile. In math, the US effect size drops to 0.07: from the 50th to the 53rd percentile. Of course, what you can't determine in a study like this -- even when taking about these small practical effects -- is why you got the gains. Is it peer effects, which are real? 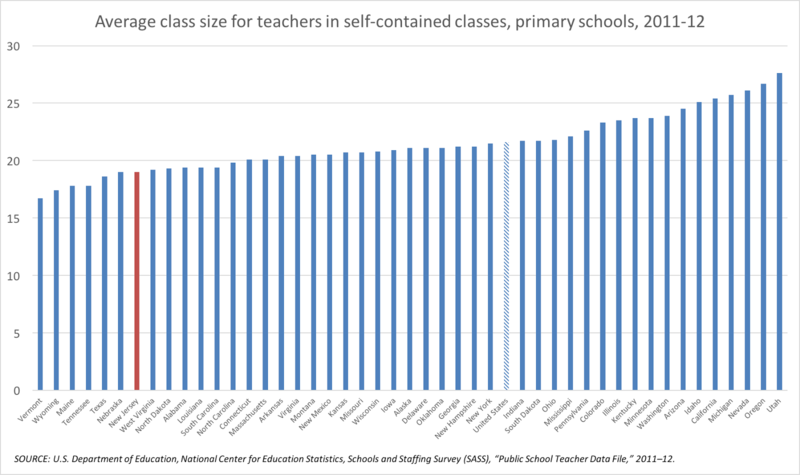 Hard to replicate those: this isn't Lake Wobegon where all the children are above average (see Bruce Baker for more on this). But does it really matter? Even in a meta-analysis with some really questionable biases, the practical effects of voucher programs on test scores in the United States are very, very small. But we're never going to have a serious conversation about this so long as the voucher industry is willing to put folks like Rebecca Friedrichs in front of the public to spout a bunch of alternative facts. Instead, we'll get a lot of blather about "choice" from people who appear to have no idea what they are talking about. Let's ask a little better of ourselves, shall we? ADDING: Hunt around a little on the PragerU site. Among other things, you can watch a piece that asks: "Is Islam a religion of peace?" Are all of you "social justice reformers" OK with working with these kind of folks?